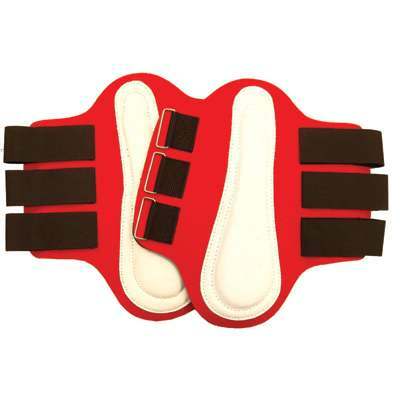 We offer the lowest prices on Nylon Covered Neoprene Splint Boots and many other Horse Tack products. The Nylon Neoprene Splint boot that we offer features white paded suede overlay and offers great protection for the inside of the horses leg. To protect the outside of the leg the boot is constructed with thick neoprene covered fabric with external suede patches to protect the splints. The boot features 3 velcro reverse grip straps. For horses 15 or 16 hands with normal bones Medium is appropriate on front while large is appropriate on the hind. These will come in Pairs. Only the best Splint Boots are offered at HorseTackNow.